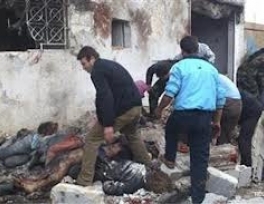 Dozens of people were killed and many more wounded in a Syrian government air strike that hit a bakery where a crowd was queuing for bread on Sunday, activists said. If confirmed, the attack on Halfaya in central Syria, which was seized by rebels last week, would be one of the deadliest air strikes of Syria's civil war. Videos uploaded by activists showed dozens of bloodstained corpses lying amid rubble and shrapnel. An adolescent boy with both his feet blown off lay flailing in the middle of a road. "When I got there, I could see piles of bodies all over the ground. There were women and children," said Samer al-Hamawi, an activist in the town. "There are also dozens of wounded people." 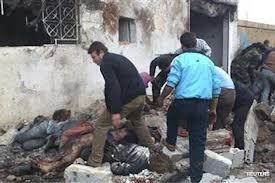 Residents of Halfaya told Reuters they estimated 90 dead. The Syrian Observatory for Human Rights, a British-based group with a network of activists across Syria, counted 60 killed. "The number is likely to rise because there are dozens of wounded being treated in the area and nearby hospitals, among them 50 in critical condition," it said. Activists say more than 44,000 people have been killed in the 21 months since protests erupted against President Bashar al-Assad, inspired by the Arab Spring revolutions in Tunisia, Egypt and elsewhere. Amid the latest carnage, United Nations-backed crisis mediator Lakhdar Brahimi arrived for more talks in Syria. He had to drive from neighboring Lebanon because fighting around Damascus International Airport has effectively shut it down. The uprising has grown into civil war, with death tolls regularly topping 100 people a day as the army hits back at rebels who have made a string of advances across the country, including around the capital. According to the Observatory, more than 180 Syrians, civilians and fighters, died on Sunday. A force of 200 rebel fighters seized the 135 Infantry Brigade base in the village of Hawa, a mostly Kurdish area in northern Aleppo province, rebels said on Sunday, as they showed journalists the base. After overcoming about 150 soldiers in the raid on Saturday, they seized weapons including two field guns, three anti-aircraft guns and dozens of boxes of Kalashnikov assault rifles, they said. In defiant remarks, Syrian Information Minister Umran Ahid al-Za'bi said rebels and their foreign allies should "forget" trying to topple Assad. He appeared to move away from the conciliatory tone of the Syrian vice president, who said last week that neither side could win the war and called for a national unity government. "These military efforts to try to topple the government, of getting rid of the president, of occupying the capital ... Forget about this," al-Za'bi told a news conference in Damascus. "I have general advice to those political powers that reject dialogue: time is getting short. Hurry and move on to working on a political solution." Brahimi, who replaced Kofi Annan after the former U.N. chief failed to get Assad and world powers to agree on a way to end the conflict, was expected to meet the president on Monday. Western powers and some Arab countries have repeatedly demanded that Assad step down. Witness Hamawi said more than 1,000 people had been queuing at the bakery in the town of Halfaya. Shortages of fuel and flour have made bread production erratic across the country, and people often wait hours to buy loaves. "We hadn't received flour in around three days so everyone was going to the bakery today, and lots of them were women and children," Hamawi said. "I still don't know yet if my relatives are among the dead." New York-based Human Rights Watch condemned army air strikes on bakeries earlier this year, arguing that in some incidents the Syrian military was not using enough precision to target rebel sites, and in other instances it may have intentionally hit civilians. In video from the attack site, women and children cried and screamed as men rushed with motorbikes and vans to carry away victims. There was no independent media access to the scene, as the government restricts press access in Syria. In one video, the cameraman could be heard sobbing as he filmed. "God is great, God is great. It was a war plane, a war plane," he cried. One man was seen stopping to pick up half a corpse lying in the street, wrapping it up in his own jacket and carrying it away. Residents were using their bare hands to dig for bodies underneath blocks of concrete. "Where are the Arabs, where is the world?" shouted one man. "Look at all of these bodies!"